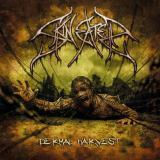 Swedish death metal newcomers Skineater are something of a mini-supergroup, with ex-members of Defleshed and Carnal Forge in the ranks. Formed in 2008, the band haven't exactly rushed to release an album, with just a demo in 2010 to their name otherwise, but listening to debut full-length Dermal Harvest that's not a bad thing, as they've clearly taken their time to craft a quality album. With elements of both traditional Swedish death metal and melodic death to their sound, Skineater aren't revolutionary or especially original, coming across at times as a combination of At The Gates and Cannibal Corpse, but they are very enjoyable, and it’s that which makes Dermal Harvest stand out from the crowd. Opening track He Was Murdered roars in, soon changing pace for a complex mixture of groove and melody with surprisingly catchy vocal lines. Songs are well-written, with clear hooks that don’t take away from the atmospheric effect or sheer excellence of the riffs – Dismantling is a good example. Certain moments are downright brutal, such as the galloping thrashiness of Your Life is Mine or the Morbid Angel tribute Solitude Discord. And the band seem to save the best songs for the second half of the album, with the infectious riffing of Stab and Cannibal Corpsean crunch of Drifting particular highlights. Thousand Dead Faces mixes melodic and more brutal strains of death metal into a truly lethal combination, and is ultimately my favourite track here. Ultimately, let’s face it, Dermal Harvest isn’t a classic, and Skineater are unlikely to release one as long as they’re making this sort of music. But this is a solid, enjoyable set of songs and a promising debut from a new band that deserve the attention of death metal fans who appreciate quality songwriting.